Pump Up Your Book presents The Last Confession of The Vampire Judas Iscariot blog tour. Learn more about the tour on Pump Up Your Book’s website or view the details and dates below under Tour Schedule. 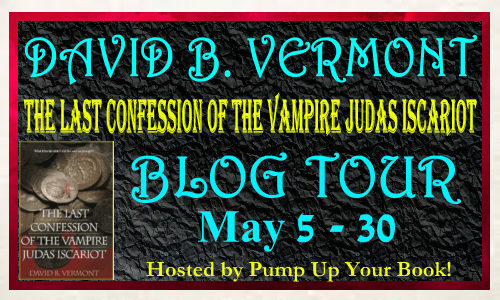 This entry was posted in Blog Tour, The Last Confession of The Vampire Judas Iscariot and tagged Blog Tour, David Vermont, May 5 - 30 Blog Tour, Pump Up Your Book, The Last Confession of The Vampire Judas Iscariot. Bookmark the permalink.